The descriptive information given by the priest who wrote this week’s “Sermons that Work,” provided in some detail the marriage customs common to first century Palestine. I found this information extremely interesting. On reading I realized that in that part of the world not much has changed. For example, the business transaction of marriage between the woman’s family and the man’s family is still the practice in large parts of the Muslim and other cultures. Marriage is generally a money contract in which the woman’s father is paid for his daughter. With that payment he gives permission for the daughter to leave his house and live in the man’s house and with his family. Much of the time neither the woman nor the man knows each other—it’s all about money. Then, the writer of this week’s “Sermons that Work” described the purpose of and need for a wedding garment. This has nothing to do with either the bride or the groom; it’s about the guests invited to the wedding party. Apparently, in first century Palestine, every man was expected to have a wedding garment hanging a in a closet—or somewhere safe—to wear in the event he was invited to a nuptial party. Further, wedding parties could and did go on for several days. They did not celebrate the joy of nuptial love but instead celebrated the fact that two patriarchs were able to come to mutually agreeable terms. The parties lasted as long as the bride’s father could supply food and wine. In the story of the wedding at Cana, just such an event was going on. Had Jesus not taken care of the matter, the party would have been short-lived and the drunks would have gone home early. In most places in the world, wedding ceremonies take place in the mayor’s office, or in front of a magistrate. After the vows are exchanged and documents signed, the couple might go to the church for a nuptial blessing. This practice highlights the certainty of the civil nature of marriage and down plays any religious connection. Even at the wedding party Jesus describes, it is unlikely a rabbi or temple priest was there or needed to ensure the permanence of the marriage bond. Marriage was, and still is, in many parts of the world a contract to assure the continuing lineage of the groom’s family. It was and is not now holy, sacred, or a religious act of love or affection of any kind. Often we fail to acknowledge that it still is a contractual event. When I, as a priest, officiate at a wedding, what I am doing is leading the couple through their vows, solemnizing the contract of fidelity between a man and a woman as required by the state. The religious part of the ceremony comes after the couple is legally married. They come to the altar and often I tie my stole around the newly-weds’ hands and pronounced God’s blessing on their mutual consent to live together as husband and wife. After the ceremony I sign a document that attests to that fact and deliver it to the county recorder of deeds. In other words, marriage in general is a contractual business not a religious activity. When Fundamentalist Christians demand that marriage be between one man and one woman, as defined by the Bible, they do not know or understand Biblical marriages. Laban tells Jacob he can have Rachel if he works seven years for her, but he tricks the lad and give him Leah instead. Jacob must work another seven years for Rachel. Jacob ends up having two wives. Multiple wives were typical of family unions in that culture. The Hebrew Bible Patriarchs were, on the whole, Polygamists. 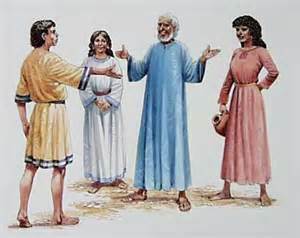 Recall, for example, the story of Jacob who worked seven years for his uncle Laban in order to gain the right to marry the woman Rachel, but instead he got Leah. How could that happen! Well, he didn’t see his bride until she lifted her veil and Laban insisted his older daughter had to go first. Jacob objected, but he kept Leah anyway and fathered children with her. Then he made a new contract with Laban to obtain Rachel. Now this might be a love story in our sense of chivalry, but the attraction was basically one of genetics—beautiful Rachel appeared more fertile and Jacob believed she would produce handsome sons. Therefore, if we are to have biblically based marriages, they can be polygamous, families can exchange money for daughters, and women can be held in perpetual servitude. Jesus often speaks of marriage as a union between him and his followers—the Church. He is the bridegroom and the Church is the bride. In terms of marriage between a man and a woman he speaks only in terms of divorce. Yes, he was at a wedding in Cana and we can rightly presume his presence blessed the act of marriage, but we cannot presume that he was against contractually based marriages, or any other kind of joint living arrangement. He seems to speak of divorce in terms of its unfairness to women. Men could end their marriage relationships by only saying, “I divorce you.” The woman is then ejected from the family circle and left to fend on her own—most possibly, her birth family will not take her in—meaning she is left in dire poverty. There is deeper meaning than the nature of marriage in the parable Jesus tells of the king who wants to have a lavish banquet for his son’s wedding. The rich and powerful are invited to have a positive and meaningful relationship with the king—a good party often brings people together in a closer bond. They refuse. The rich and powerful believed they already had some special relationship social status because they were rich and powerful. In his anger the king destroys them and takes away their riches and the power. No wedding garment, no party! So, the king invites those of lesser status to come to the party. As mentioned earlier, they have stored in their poor homes garments suitable for such an event—except one person. It isn’t the fact that the man didn’t get the memo, “Wear your wedding garment”—he knew the rules. It was the fact that he had first, not prepared himself for such an event, and second, he arrogantly showed up thinking he could get by without making any effort to be in the presence of the king. That strikes me to be like the current phrase, “spiritual but not religious.” There seems to be a move among people that one can say I believe in spiritual things—karma, magic crystals, nature, secret pyramids, good feelings, and maybe even God—but don’t believe in religion. Their argument is that religion has a bad history. Granted, but it is through religion we are invited to the banquet. If our garments are only ethereal ideas of spirituality, we are not ready and prepared to be in the presence of God. We come into the presence of God when we take into our selves the Body and Blood of Jesus in the Holy Eucharist. This is the great feast of God for his son—the bridegroom of the faithful. The wedding garment is not clothing but an attitude, a desire, a commitment to be God’s person. One cannot simply be an on-looker who thinks being spiritual is the answer when total commitment to the teachings of Christ Jesus and living in imitation of his life is the garment required. Baptism and the Eucharist are the means by which we can shed the nakedness of mere spirituality. Committing one’s self to the baptismal vows faithfully to come into the presence of God through the Sacrament leads to a change of garments. Jesus does not say in this parable there is no hope. All of humanity is invited. However, he warns those who think they are the universe’s center, rejecting the invitation of God, are self-condemning. Those of low estate responding to the invitation, but are faithless, also are as self-condemning as the haughty. Those baptized in faith, regardless of social status, remembering they were made Christ’s own forever, and humbly bring that faith to the table of our Lord, are in the proper garment ready to enjoy the eternal feast.